Sinkers are lead or brass weights used to get bait to the bottom of a body of water. Sinkers come in a variety of sizes and styles. Some sinkers are tied securely to the line, others are threaded on so they can slide freely. Each type of sinker has a specific application. Some sinker types include egg, bullet, bell and split shot. Sinkers are used in both freshwater and saltwater fishing. Thread the line through an egg sinker. Use the lightest weight sinker possible. Heavy sinkers will prevent you from feeling a fish bite. Thread on three to four plastic beads. The beads protect the knot and make noise while fishing the rig. Tie on a swivel using a strong knot. Attach the hook to the swivel with a 2 to 3 foot length of line. Plastic worms are the preferred bait for a Carolina rig. Thread a bell type sinker onto the fishing line, then a plastic bead or two. Like the Carolina rig the beads will protect the knot from the sinker. 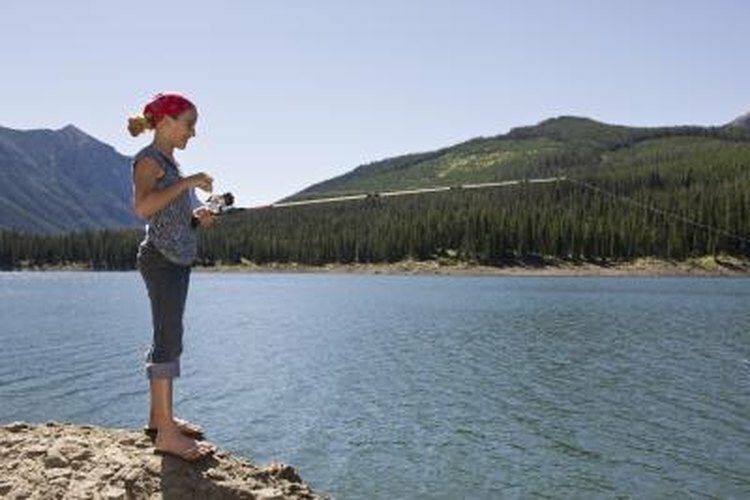 Create a leader by tying a hook to 12 to 18 inches of fishing line. Tie the hook line to one loop of the swivel. Tie the main line to the other end of the swivel. Tie a hook about 18 inches from the end of the line. The tag end will be used with a sinker. Crimp split shot on to the tag line. The position of the sinker will determine how high the bait will run in relationship to the bottom. Start with the least amount of weight and add split shot as needed. Trim any extra line from the tag end. Thread a bullet sinker onto the main line. Be sure to thread the line through the small end of the sinker. Tie a worm hook to the line. Always use a sharp hook to help with hook set. Trim any excess line. Use a 6-inch or longer plastic worm as bait. Howard Altman is a transplanted New Yorker located in Centerton Arkansas. He has over 25 years of experience in the information technology field programming and supporting code. His hobbies include keeping a 1988 Ford F150 up and running and 30 years of Radio Control (cars boats and planes) experience. He has been writing how-to articles since 2008.